17 2 STRESS FIELDS FOR SIMPLE STRUCTURES 2. 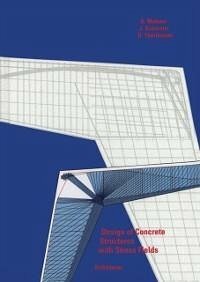 1 INTRODUCTION In this chapter the behavior and strength of simple structures made of rein- forced or prestressed concrete is investigated with the aid of stress fields. In particular, the webs and flanges of beams, simple walls, brackets, bracing beams and joints of frames are investigated. By this means, the majority of design cases are already covered. In reality, all structural components are three-dimensional. Here, however, components are considered either directly as two-dimensional plate elements (i. e. the plane stress condition with no variation of stress over the thickness of the element) or they are subdivided into several plates. Since two-dimensional structural elements are statically redundant, it is pOSSible for a particular loading to be in equilibrium with many (theoretically an infinite number of) stress states. If the lower bound method of the theory of plasticity is employed, then an admissible stress field or any combination of such stress fields may be selected. In chapter 4 it is shown that this method is suitable for the design of reinforced concrete structures, and the consequence of the choice of the final structural system on the structural behavior is dealt with in detail. The first cases of the use of this method date back to Ritter  and Morsch , who already at the beginning of the century investigated the resultants of the internal stresses by means of truss models. 1 Introduction and Theoretical Basis.- 1.1 Introductory Remarks.- 1.2 Fundamentals of the Theory of Plasticity.- 1.2.1 Material Behaviour.- 1.2.2 Limit State Theorems of the Theory of Plasticity.- (a) Static Solution.- (b) Kinematic Solution.- 1.3 Engineering Methods.- 2 Stress Fields for Simple Structures.- 2.1 Introduction.- 2.2 Beams with Rectangular Cross-Section Subjected to Bending and Shear.- 2.2.1 Deep Beams, Concentrated Loads.- 2.2.2 Deep Beams, Several Concentrated Loads.- 2.2.3 Deep Beams, Distributed Load.- 2.2.4 Beams with Medium Slenderness Ratio, Concentrated Loads.- 2.3 Beams with I-Cross-Section Subjected to Bending and Shear.- 2.3.1 Slender Beams, Concentrated Loads.- 2.3.2 Slender Beams, Distributed Load.- 2.3.3 General Case, Practical Design.- 2.3.4 Beams of Variable Depth.- 2.3.5 Compression Flange.- 2.3.6 Tension Flange.- 2.4 Members Subjected to Torsion and Combined Action.- 2.4.1 Introduction.- 2.4.2 Warping Torsion (Open Cross-Sections).- 2.4.3 Circulatory Torsion.- 2.4.4 Circulatory Torsion Combined with Bending and Shear.- 2.5 Brackets.- 2.6 Coupling Beams.- 2.7 Joints of Frames.- 2.7.1 Corner Joint, Compression on the Inside.- 2.7.2 Corner Joint, Tension on the Inside.- 2.7.3 Joints of Frames with Three Connecting Beams.- 2.7.4 Joints of Frames with Four Connecting Beams.- 2.8 Beams with Sudden Changes in Cross-Section.- 2.9 Walls.- 2.9.1 Shear Walls.- 2.9.2 Diaphragms.- 2.10 Three-Dimensional Example.- 3 Material Strengths and other Properties.- 3.1 Reinforcing Steel.- 3.2 Concrete.- 3.2.1 Uniaxial Stress State.- 3.2.2 Three-Dimensional Stress State.- 3.2.3 Concrete with Imposed Cracks.- 3.2.4 Cracks: Aggregate Interlock.- 3.3 Force Transfer Reinforcement - Concrete.- 3.3.1 Anchorage of Reinforcing Bars.- 3.3.2 Splices of Reinforcement.- 3.3.3 Force Deviations.- 4 Additional Considerations for the Development of Stress Fields.- 4.1 Remarks on Plastic Design Applied to Reinforced Concrete.- 4.1.1 Behavior of Statically Indeterminate Beams.- 4.1.2 Selection of the Inclination of the Compression Field in the Web of Beams.- 4.1.3 Redistribution of Internal Forces and Ductility Requirements.- 4.2 Procedure for Developing Stress Fields.- 4.2.1 Introduction.- 4.2.2 Spreading of Force in a Wall Element Loaded in Tension.- 4.2.3 Spreading of Force in a Wall Element Loaded in Compression.- 4.2.4 Further Cases.- 4.3 Impaired Strength through Wide Cracks.- 4.4 Stress Distribution in Highly Stressed Compression Zones.- 4.4.1 Introduction.- 4.4.2 Stress Fields for Beam-Columns.- 4.5 Prestressed Beams.- 4.5.1 Beam with straight cable.- 4.5.2 Beam with curved cable.- 4.5.3 Anchorage zone of pretensioned beams.- 4.5.4 Unbonded prestressed beams.- 5 Plane Stress, Plate and Shell Elements.- 5.1 Plane Stress Elements.- 5.2 Slab Elements.- 5.3 Shell Elements.- 6 Outlook: Computer Programs.- References.